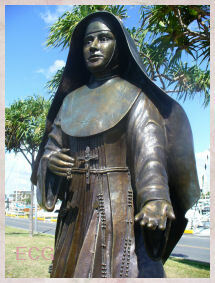 Patron Saint of Peru. Patron Saint of Animals. and all the animals of he earth. Keep unsullied their lips purpled with Your Precious Blood. We commemorate the feast of All Souls. 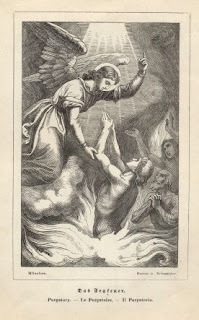 Traditionally, the entire month of November is devoted to the Holy Souls in Purgatory. It is a wonderful opportunity to help them get into Heaven. The following are some ways. 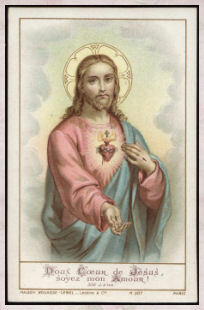 My Jesus, by the sorrows Thou didst suffer in Thine agony in the Garden, in Thy scourging and crowning with thorns, in the way to Calvary, in Thy crucifixion and death, have mercy on the souls in purgatory, and especially on those that are most forsaken; do Thou deliver them from the dire torments they endure; call them and admit them to Thy most sweet embrace in paradise. Our Father, Hail Mary, Eternal rest, etc. Source: St. Michael's Center for the Blessed Virgin Mary where you can find more prayers. "An indulgence is granted the Christian faithful who devoutly visit a cemetery and pray, if only momentarily, for the dead. This indulgence is applicable only to the souls in purgatory. This indulgence is a plenary one from November 1 through November 8 and can be gained on each one of these days. One the other days of the year this indulgence is a partial one. It is therefore, a holy and wholesome thought to pray for the dead, that they may be loosed from sin." Our Lord showed St. Gertrude the Great that the following prayer would release a vast number of souls from purgatory each time it is said. Eternal Father, I offer Thee the most Precious Blood of Thy Divine Son, Jesus, in union with the Masses said throughout the world today, for all the Holy Souls, In purgatory, for sinners everywhere, for sinners in the universal church, those in my own home and within my family. Amen. Thanks to Sue of Half the Kingdom for sharing. Immortal God, holy Lord, Father and Protector of all You have created, we raise our hearts to You today for those who have passed out of this mortal life. In Your loving mercy, Father, be pleased to receive them in Your heavenly company, and forgive the failings and faults they may have done from human frailty. Your only Son, Christ, our Savior, suffered so cruelly that He might deliver them from the second death. By His merits may they share in the glory of His victory over sin and death. For all the faithful who have died we pray, but in particular for those dear to us, parents, relatives, and friends. Nor do we forget all who did good to us while on earth, who helped us by their prayers, sacrifices, and example. 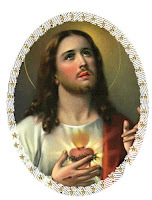 We pray also for any who may have done us harm, and stand in special need of Your forgiveness. May the merits and prayers of our Virgin Mother, Mary, and those of all Your angels and saints, speak for us and assist them now. We ask this in Christ's name. Amen. REFLECTION: The pain of loss and separation at death is hard to bear. Let us turn to God, the Author of Life, for comfort and consolation in sorrow. God sends us every trial for a greater good. For love of us, remember, He did not spare His only Son. PRAYER: O Lord, God, have pity on us and the departed souls so dear to us, and relieve our pain and grief. By the suffering of Christ, our Savior, in His agony and passion have mercy on all our beloved dead. Assist us, too, to greater faith in Your goodness. Amen. REFLECTION: Let us think often of those souls suffering as they are purified of their earthly faults and failings. They endure the pain of separation from God, and yet are consoled by the certainty of their salvation. God's beauty attracts them even as the weight of their unworthiness holds them. They need and cry to us for help. PRAYER: Have pity, O Lord, our God, on all who patiently await the joy of Your presence. Forgive their sins and failings, and in Your goodness summon them soon to You. Amen. REFLECTION: By our offering of Mass, and our faithfulness in prayer and good works, we help those dear to us who may still remain in purgatory. Those we aid on the last stage of their journey home to God will never forget us for our help in their hour of need. 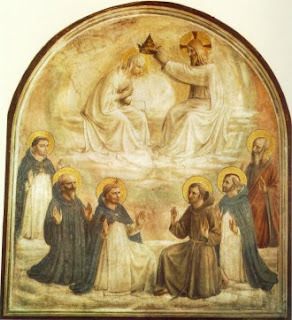 PRAYER: Lord, our God, may the merits of Jesus Christ, of His virgin Mother, and of all the saints intercede for us and assist those who still patiently await the vision of Your glory. Amen. REFLECTION: We can always be close to those we love who have died when we, ourselves, draw closer to Christ. We help them best by a useful and devout life, by the offering of Mass for them, and by constant prayer and good deeds done in their memory. 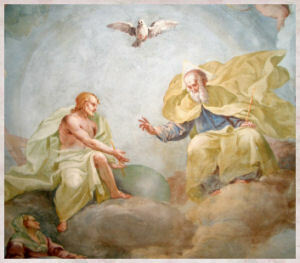 PRAYER: Help us, Lord, our God, to honor and help our beloved dead by doing Your will faithfully each day. May the merits of our Lady and the saints aid us to do so. Amen. REFLECTION: How easy and human it is to forget with the passing of time those we loved so dearly while they lived! We should pray for them often in gratitude for their kindness to us, and the good example they gave us in times past. PRAYER: Come to our aid, O God, and help us to pray faithfully for our dear dead. By Your grace enable us to honor their memory by a good Christian life so that we may one day happily join them in Your Holy presence. Amen. REFLECTION: God loves our dear departed much more than we ever can. He called them home to Himself at the time He did because it was then best for them and for us. Be consoled, then, that they are now safe in His hands where no malice or torment can touch them. PRAYER: O Lord, our God, teach us to see Your good and gracious purpose working in all our trials and bereavement. Have mercy on our dear departed whom we commend to You, forgive them their sins and failings, and give them rest everlasting. Amen. REFLECTION: Those whom we loved in life are closer to us now with God than they ever were on earth. Only a thin veil separates us from the unseen world in which they now live. Faith pierces that veil though our bodily eyes cannot. We should pray as constantly for our dear dead as they never fail to pray for us. PRAYER: O Lord, our God, show us the reality of Your divine life, and help us to pray often in faith for and to those we love who are now with You. 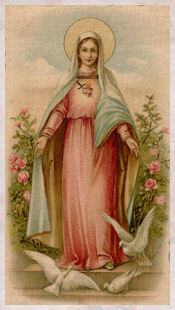 Please help us by the merit our Blessed Lady gained beneath Christ's cross to be patient, faithful, and loving. Amen. REFLECTION: Those we love, who have gone before us into life, are as concerned for our welfare as we should be for theirs. Now, they see the world for what it is, a preparation for the unending bliss they enjoy. They intercede for us always. PRAYER: O Lord, our God, by the prayers of our beloved dead may we be spared sin and trouble on our earthly journey, and may we ever be ready by obeying Your commandments to follow them home. Amen. REFLECTION: We should be comforted often by recalling the joy of our departed as they entered God's presence. They have gained their heart's desire and with Him everlasting happiness. They wait for us to join them there. PRAYER: O Lord, our God, increase our faith. Inspire us to pray often for the faithful departed still being purified, and to pray to those already in the glory of Your presence. Amen. REFLECTION: As we think and pray for those now dead who were close to us here below, we should remember how certain it is that we will one day join them. Now is our time to make ready. Be with us, Lord, our God, on our earthly journey. Please guide us safely to the eternal home You have prepared for us. When our way is hard, give us a vision in faith of the splendor of that heavenly home. Amen. REFLECTION: When we are ever intent on God's will, and eager for His kingdom to come, we are living worthy of the promises of Christ. When God calls us home, our work will be finished here, and He will give us Himself as our eternal reward. PRAYER: Help us each day, O Lord, our God, to meet our daily tasks in the spirit of Christ whether our work seems important in the eyes of the world or not. Preserve us from every evil, and confirm us in doing good so that death, when it comes, will be for us the door to perpetual life with You. Amen. REFLECTION: Christ's Easter victory over sin and death is our assurance of our own future life of unfading glory when "death shall be no more." PRAYER: May Your Holy Spirit ever remain with us, O Lord, our God, to keep us faithful to Your word, and always ready by enduring with Christ to share His victory over sin and death. Amen. Did Catholics Really Add Books to the Bible? Well, the Tiber Jumper will scientifically prove to us that we did not. Yes, this is all in good fun but his point is serious! 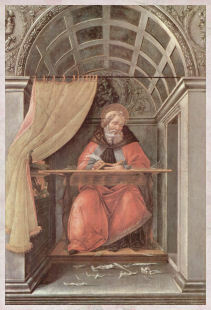 God our Father, source of all holiness, the work of your hands is manifest in your saints, the beauty of your truth is reflected in their faith. May we who aspire to have part in their joy be filled with the Spirit that blessed their lives, so that having shared their faith on earth we may also know their peace in your kingdom. Grant this through Christ our Lord. Amen. The Solemnity of All Saints Day and All Souls Day are celebrated on November 1 and 2, respectively. On All Saints Day, the church celebrates all the saints: canonized or beatified, and the multitude of those who are in heaven enjoying the beatific vision that are only known to God. This day should inspire us with tremendous hope as the saints who have gone before us to the heavenly home call on us to follow them. Meanwhile, on All Soul's Day the church observes the commemoration of the faithful departed who still groan in Purgatory, so that they may join as soon as possible the inhabitants of the heavenly city. On this day, the priest must recite the Office of the Dead and all the masses are to be of Requiem. 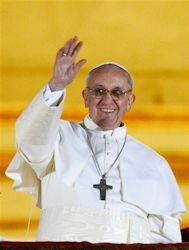 Black vestments may be worn as well. Father in Heaven, Creator of all, You ordered the Earth to bring forth life and crowned its goodness by crating the family of man. In history's moment when all was ready, You sent Your Son to dwell in time, obedient to the laws of life in the world. Teach us the sanctity of human love, show us the value of family life, and help us to live in peace with all men that we may share in Your life forever. I Didn't Know Fr. 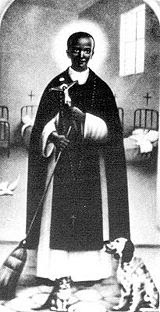 Euteneuer Was an Exorcist! Audience members at Church of the Annunciation, Rosedale, were so intently focused on Father Thomas J. Euteneuer’s exorcism talk Oct. 21, that when someone in the crowd muffled a sneeze – they flinched. About 130 people attended “An Evening with an Exorcist,” listening carefully as Father Euteneuer talked about how demons target their victims and how an exorcism takes place. 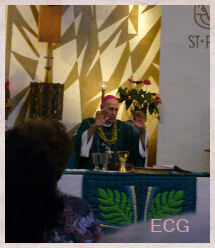 Father Euteneuer, a priest for the Palm Beach, Fla., diocese who is living in the Archdiocese of Arlington, Va., said he’s been involved in exorcisms for nearly five years and has performed three or four that expelled demons as well as several deliverances, which use prayer teams for people who aren’t fully possessed. 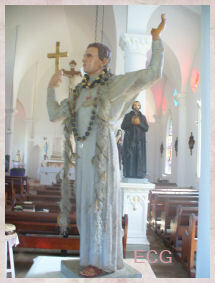 I don't know how I feel about non-Catholics or Catholics for that matter burying statues of St. Joseph. Wouldn't it be better to pray to him and ask for his help and intercession? I've been checking out Halloween entries around the Catholic blogosphere and there are some pretty good posts out there. I really don't have much to add. I did find my post from last year (actually others found it and it came up in my counter as a link). Note: The links no longer work but I did get permission from the author to post it on my blog last year. "Take advantage of your short time on earth. Do those things that will lead you to eternal life. Come to Me frequently before the Blessed Sacrament, especially, when you are hurting with worry, fear, anxiety and pain and suffering of any kind. 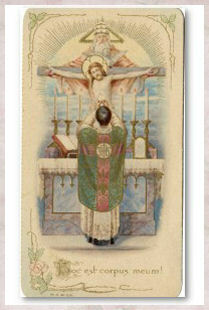 Attend Mass and receive Holy Communion more frequently. Pray more and say the Rosary. Get to know Me better so that I can better help you carry your cross. O Immaculate Queen of Heaven and Earth, Mother of God and Mediatrix of every grace! I believe that Thy dearly beloved Son, Our Lord Jesus Christ, is truly, really and substantially contained in the Most Blessed Sacrament. I love Him above all things and I long to receive Him into my heart. 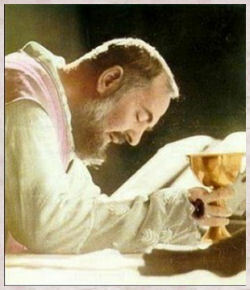 Since I cannot now receive Him sacramentally, be so good as to place Him spiritually in my soul. 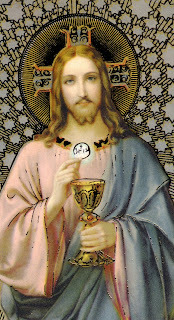 O my Jesus, I embrace Thee as One, Who has already come, and I unite myself entirely to Thee. Never permit me to be separated from Thee. Your world through excessive speed. Faith for all defects supplying. R. having all sweetness with it. conscious of the fruit of Your Redemption. You Who live and reign forever and ever. 1. 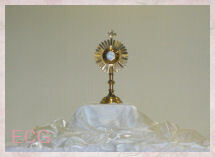 We are spending quality time with our God, truly present in the Most Blessed Sacrament, one-on-one. 2. 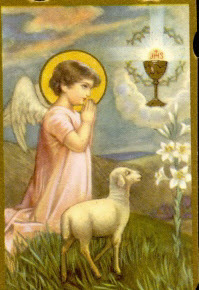 We have an opportunity to keep Him company when He is alone in the Adoration Chapel. 3. We can go to Him for help with our problems. 4. We can listen to Him speak directly to us if we are quiet and still. 5. You can find the peace you cannot find anywhere else. 6. To ask Him to help you recall all your many transgressions especially those hidden so deep you have forgotten them. This will help you make a good confession because you will have perfect contrition. 7. You can talk to Him. He will listen. You couldn't find a more loyal and faithful friend. 8. He will help put your worries in perspective. 9. You can ask Him to help your loved ones in need of prayers. 10. To love Him as well as adore Him. 11. To tell Him all your troubles and woes and then feel the comfort that will envelope you when He embraces you in love. 12. For that golden silence we so long for and need. 13. To feel joy in your heart and soul. 14. To ask for help for the less fortunate, the Holy Souls and others who may not have anyone else to pray for them. 15. To refresh your soul. 16. For the strength we need to overcome our sinful ways. 17. 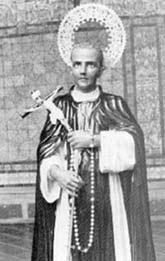 To make reparation against the numerous sins committed against God. 18. It brings you closer to God. 19. It changes you and helps you overcome your failings. 20. To give God thanks for all the graces and blessings He has blessed us with and continues to bless us with. 21. Because only those who truly love Jesus will visit Him in the Most Blessed Sacrament either exposed or hidden in the Tabernacle. 23. We have the awesome privilege of gazing at Jesus' loveliness! 24. 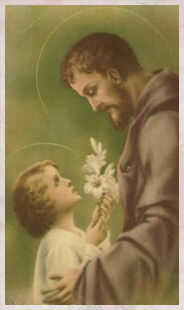 It helps us achieve humility or any other virtue we need by asking for His help. 25. This spot is for you to answer. 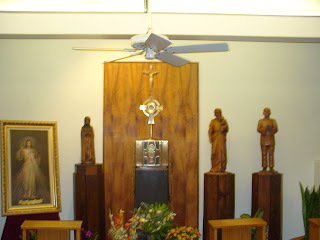 **The Most Blessed Sacrament by Fr. 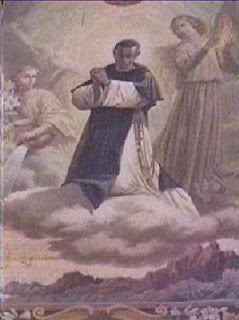 Stephano Maneli, OFM. 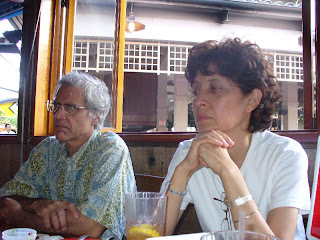 Photo taken by Joey yesterday when we had lunch with Dan's second grade teacher who is visiting the islands. The other day when I posted my responses to My Main Man Meme, I wrote that my husband was the head but I was the neck. By now everyone knows that this was a reference to the movie "My Big Fat Greek Wedding". Oh how wrong I was! 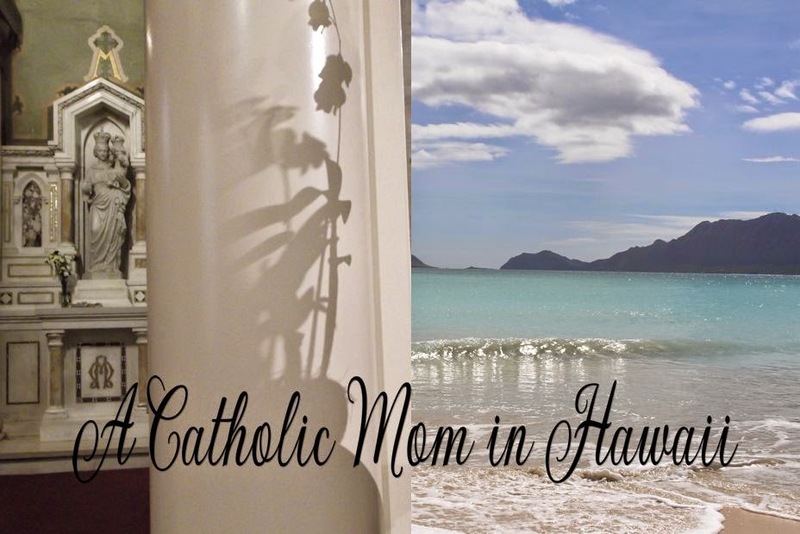 During our weekly Holy Hour, I had time to reflect on our marriage. With the help of Mother Angelica, I learned that if we fail to recognize our distinct positions in the family, there could be no peace. The family is a beautiful image of he Trinity. The man is head and he resembles the eternal Father, and like the Father he is to protect, to provide, to create, and to understand. He is to be compassionate like the Father and full of mercy. The woman is made to the image of Jesus, and like Jesus she is to be meek, loving, a means of reconciliation and gentleness. She has intuition . She has something a man doesn't have: she is intuitive. From Mother Angelica's Little Book of Life Lessons and Everyday Spirituality, Raymond Arroyo. Want to See a High Resolution Image of the Last Supper? 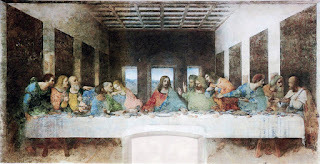 Can't get to Milan to see Leonardo Da Vinci's masterpiece "The Last Supper?" As of Saturday, all you need is an Internet connection. Officials put online an image of the "Last Supper" at 16 billion pixels — 1,600 times stronger than the images taken with the typical 10 million pixel digital camera. The high resolution will allow experts to examine details of the 15th century wall painting that they otherwise could not — including traces of drawings Leonardo put down before painting. Steve of Cartoon Key to Heaven recently shared the link to this website. know you live this every day. 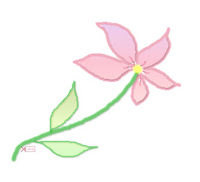 bulletin links for the free material. trying to grow the apostolate. website as a useful link that your members may like.